In March 1852, my great great great grandfather Philip Champion Crespigny (1817-1889) with his wife Charlotte Frances née Dana and their two children, Ada and Philip, arrived in Port Phillip, Victoria, Australia. Philip Crespigny, then 34, was moderately well-educated. He had attended Cambridge University, admitted on 7 November 1838 to Downing College as a Fellow-commoner. He had the status of a student who had matriculated, and he was not on a scholarship. His period at Cambridge did not lead to a career in the Church, and it appears that at the time of his arrival in Victoria he had never previously had paid employment, nor had he been in business or trade. Philip’s arrival coincided with the great rush for gold in Victoria which followed the announcement of significant discoveries in July 1851. In March of that year, Victoria had a population of about 77,000. By the end of the following year, 1852, this figure had increased by 100,000. 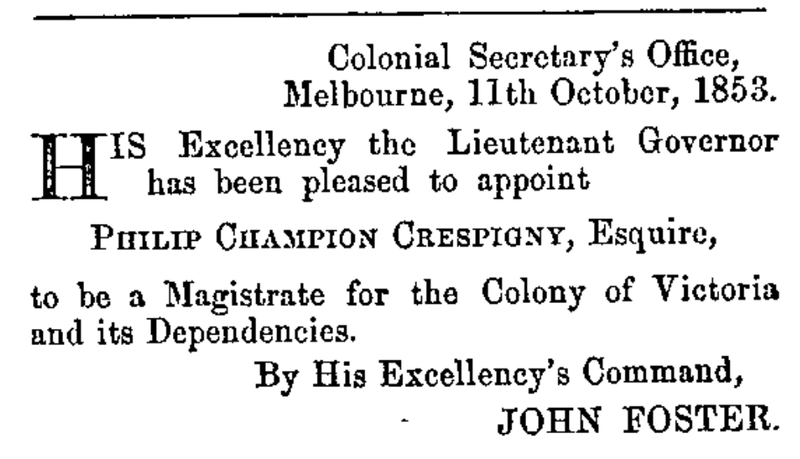 The administration of Victoria’s Lieutenant-governor, Captain Charles La Trobe, under-staffed and under-resourced, was barely able to cope with the huge population increase. The management of the goldfields was specially difficult. LaTrobe copied the New South Wales system of gold-digging licenses, designed to discourage people from joining the rush to the diggings. It didn’t work. Despite the enormous numbers of immigrants, Melbourne suffered from a serious labour shortage as men deserted their jobs to join the scramble for gold. Agricultural production fell. The harvest of wheat, for example, fell from 733,000 bushels in 1851 to 154,000 bushels in 1853. The area of land under cultivation shrank. 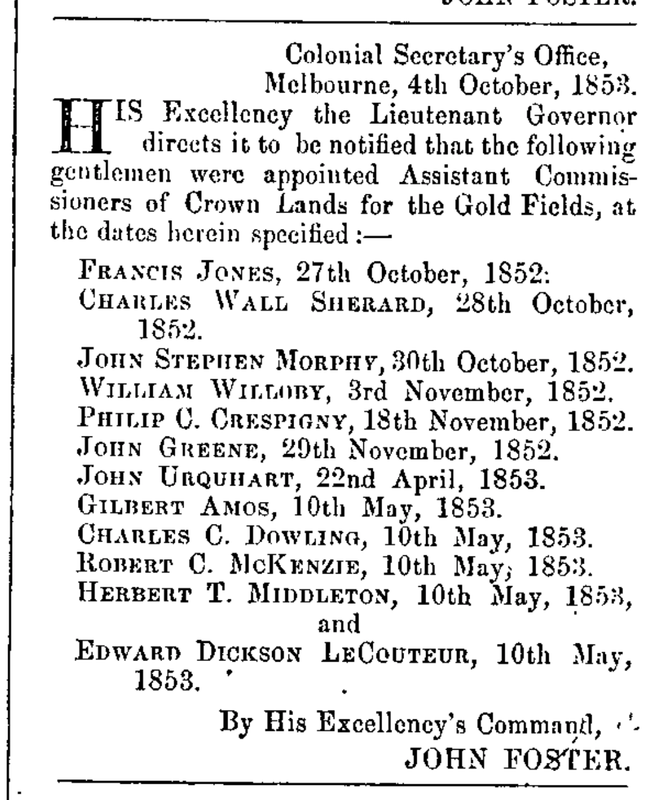 Philip was appointed an Assistant Commissioner of Crown Lands for the Goldfields on 18 November 1852. 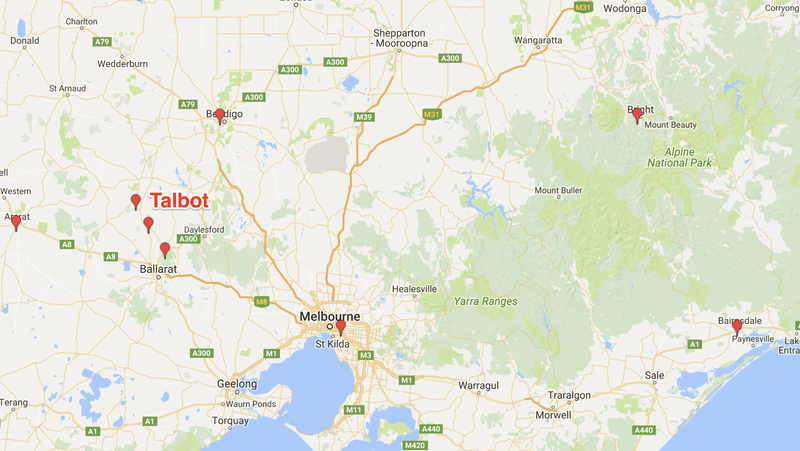 In February 1859 Philip was appointed police magistrate at Amherst, near Talbot, central Victoria. In 1861 the population of Amherst and Talbot was about 2,200. View of Talbot c 1854-1862. 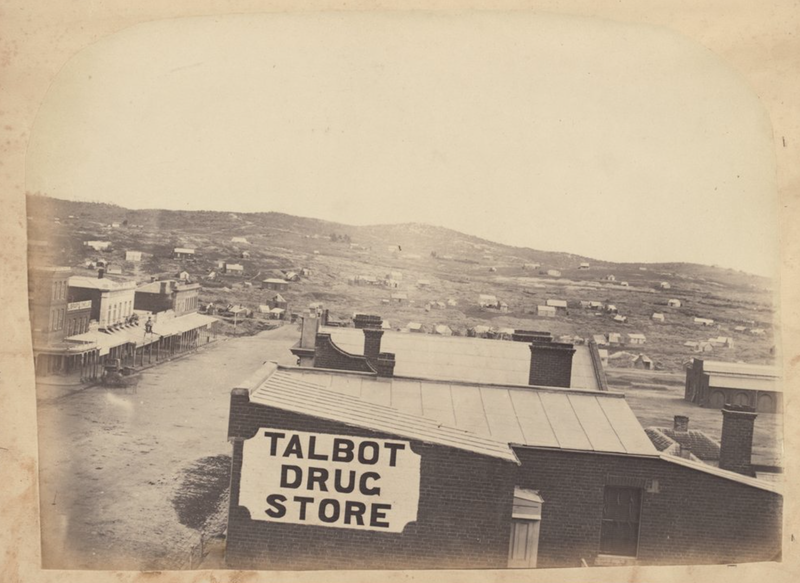 Elevated view over township, in foreground a sign on wall reading Talbot Drug Store, on left line of double storey shop fronts with porch over footpath: Metropolitan Hotel, the library, jeweller and the Theatre Royal. In the distance scattered huts and earth works. From the State Library of Victoria Image H2009.84/35. In 1869 Philip left Talbot to become magistrate and coroner at Bairnsdale. A farewell banquet for him was held in the Talbot Borough Hall. 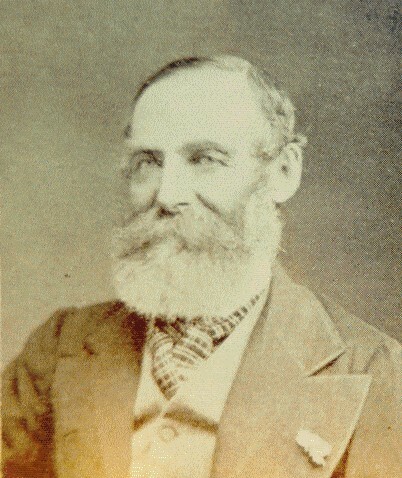 In March 1869 Mr Dowling, the magistrate who had replaced Philip, was transferred to Geelong and Philip returned to Talbot from Bairnsdale, with Clunes and Creswick added to the area he administered. 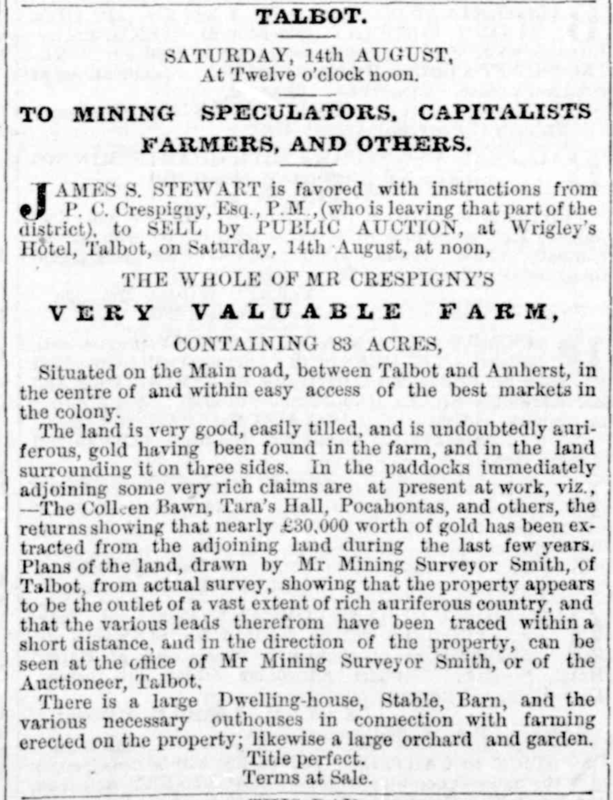 In August 1869, Philip advertised his farm near Talbot for sale. This property, of 83 acres, was on the road between Talbot and Amherst. There was a house, stable, barn, and an orchard and garden. Later in the month Warden Crespigny fell from his horse near Clunes. According to the newspaper report, he was lucky to escape serious injury. In June 1870 Philip was transferred from Talbot to Bright. When Philip took up the Bright post in north-east Victoria, the rest of his family moved to Hawthorn, a suburb of Melbourne, 330 kilometres away. Some people felt he had been badly treated. At the time of his transfer Philip Crespigny was 53. In February 1871 a rumour was reported in the Bright newspaper that the local police magistrate, Mr P. C. Crespigny, was about to be removed. In March 1871 Mr Crespigny took leave and was relieved by Mr Willoughby. 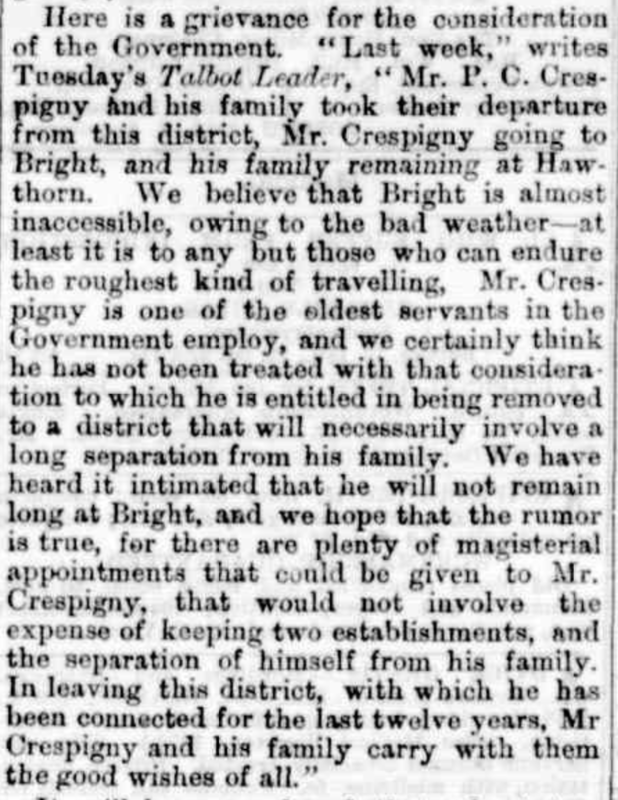 In April 1871 Mr Crespigny PM was hearing cases in Eaglehawk, Bendigo. In May it was announced that Mr P. C. Crespigny PM would succeed Mr Daly as police magistrate in the Ararat district. He remained at Ararat until he resigned from government service in 1877.